Page two laundry the old fashioned way, see page one first, it is called Laundry the old fashioned way part one. You start with clean, wet and unfolded items to be starched. 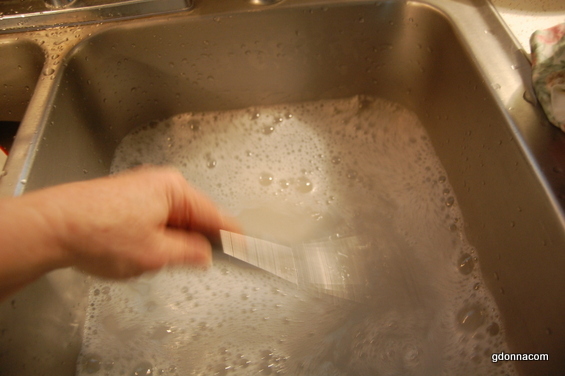 If the clean item is dry then place it in a pan or sink and wet the garment. Or remove it directly from the wash to the starch. Wet, wring it out and loosen it and set it aside. This starch will be a boiled starch. First 1/2 cup powdered starch to one cup of water. Whisk it around in a bowl or directly into a dutch oven (very large pot). 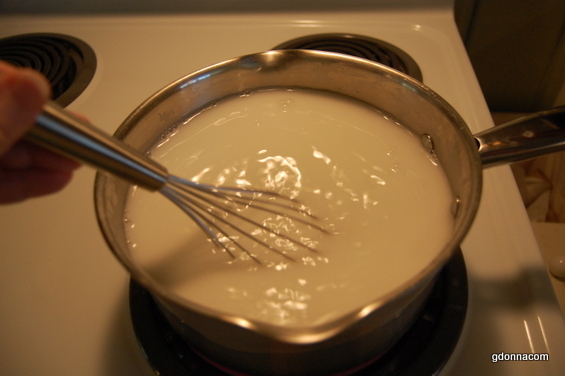 Add the mixture to the pot then add 2 quarts of water and mix well with whisk. At first I was going to make half a batch but decided to make the full batch for this article. So I moved it the the normal size pot that would be used. Notice that the starch is turning translucent. turn on the heat and bring this to a boil and boil for one minute and remove from heat. 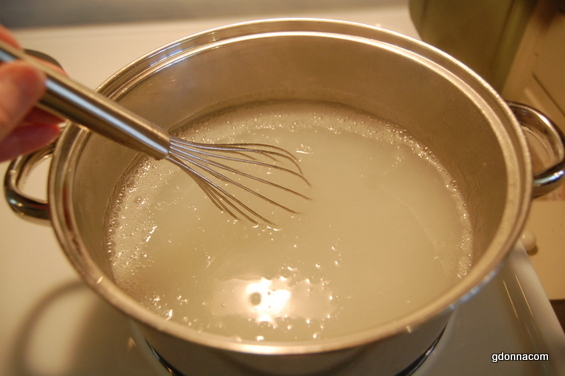 The starch must be stirred or whisked during the cooking stage. Allow plenty of room and keep a close eye on the boil, turn it down a bit if necessary . 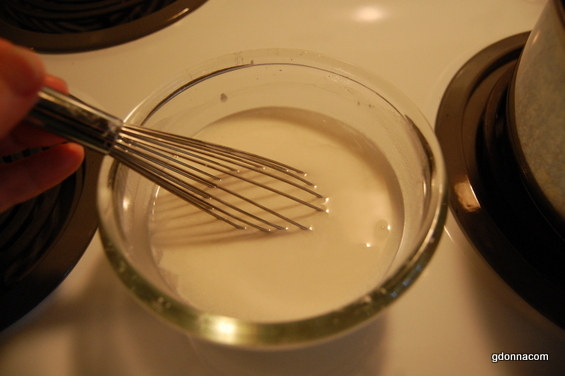 Pour the cooked mixture into a large pan or sink and for medium starch add two more quarts of cold water and whisk it together. For heavy starch, which is very stiff the two extra quarts of water would not be used. Just remember that heavy starch means very stiff! So to recap, we started with 1/2 cup powdered starch, added one cup water and mixed together, added it to the pot and added 2 quarts of water, brought it to a boil for one minute, removed it and poured it into a sink, added 2 more quarts of cold water swished it and now it is ready to use. 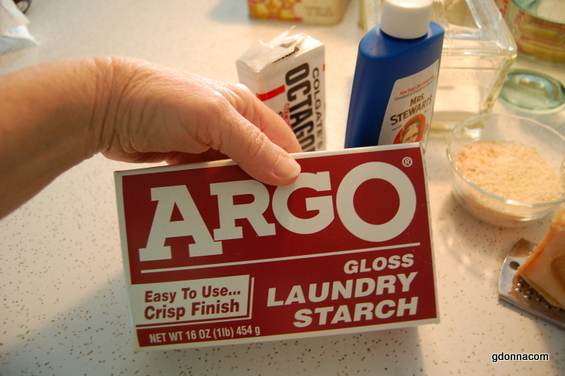 Place the unfolded item into the starch, notice to the right side of the picture above the wet clothes waiting to be starched. After completely submerging and shirt, remove it and wring out the starch. Loosen it up and place it in a pan or clean sink. Next item and so forth. Make sure that all of the fabric has been submerged in the starch. This amount of starch will do many items. But make sure the item is wet before placing in the starch. After every item has been dipped, wrung out, shaken out it is hung to dry. If you live in a dry climate you could place the shirts on a hanger to dry but we live in a very humid climate and this is the best way for our clothes to dry that have been starched.